Carlton plunges down the ladder to eighth. 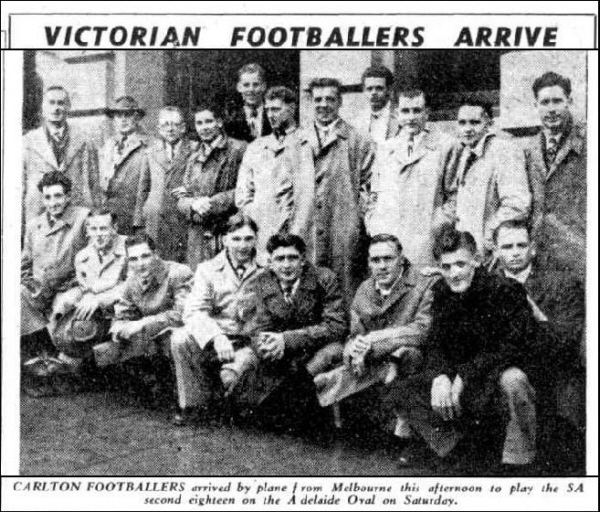 The VFL would revert to the traditional 18 round season in 1950, after experimenting with either 20 or 19 round seasons between 1945 and 1949. Carlton carried the form of 1949 that had seen it reach the Grand Final into this season. Seven wins from the first ten games had the Blues in fourth place on the ladder, 2 games behind top spot and 1 game in front of fifth place. The club had been competitive in every game, losing by only 20, 19 and 4 points in its 3 losses. In hindsight, seven wins was probably an over achievement, though. The highest winning margin was 16 points in 7 wins, and 4 of the games had been won by a goal or less. In fact supporting the team wasn't for the faint of heart, the club had 5 games in a row decided by a goal or less, from round 6 to round 10. The Blues couldn't keep falling over the line though, and lost its next 5 games. In the final 8 games Carlton could only manage 1 win, 1 draw and 6 losses to finish the season in eight place. Encouragingly the club had been competitive in nearly all games, apart from 2 losses of around 6 goals. The average margin between the Blues and the teams they played for the season was only 13 points, demonstrating the fighting spirit of the team. The Blues played a combined Bendigo League team in Bendigo on the Upper Reserve. The Carlton line up was practically the same as the last game against Essendon with the exception for Howell, Hodgson and Baird. Stafford, English and Calder replaced them. Coach Perc Bentley wanted the Blues to win the game by 20 goals. However, it ended up being a close fought game with Bendigo missing a vital chance to go 10 points up with minutes remaining. The shot on goal failed to make the distance and the ball was swept down to Carlton's end where Kevin Hunt's snap-goal gave the Blues a 4 point lead. Both Brokenshire and Baxter, usually deemed unreliable kicks, were the heroes with accurate their goal kicking. Best; Brokenshire (BOG), Baxter, Garby, Richie Green, F. Davies, Vin English. Mid season, Carlton journeyed to Adelaide to play the South Australian State Second Eighteen team on 22 July. A crowd 20,000 turned out to see the Croweaters beat Carlton by 13 points. The Weekly Times (Wednesday April 05 p67) carried a photo of the Maldon team at Princes Park. The caption said it was the first time a country team had played a League team in a practice match. The match was between recruits for the second eighteen and Maldon who were premiers of the Castlemaine League last season. 600th Win: During 1950, Carlton becomes only the second VFL club (after Collingwood) to post its 600th win. Contributors to this page: blueycarlton , molsey , pblue , Bombasheldon , PatsFitztrick , BlueWorld , WillowBlue , Jarusa , wolfister , steve and admin . Page last modified on Sunday 07 of April, 2019 18:39:28 AEST by blueycarlton. 1989 - Future Blue Ben Sexton.